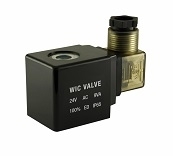 WIC Valve AVS series air actuated angle seat single acting spring return pneumatic valve use pressurized air to open and close the valve. The characteristic of the air actuated piston angle seat valve is that valve can be operated at very high temperatures, high viscosity medium, and is less sensitive to dirt particles and debris. With the fluid entry below the seat, AVS series valve can reduce the water hammering.